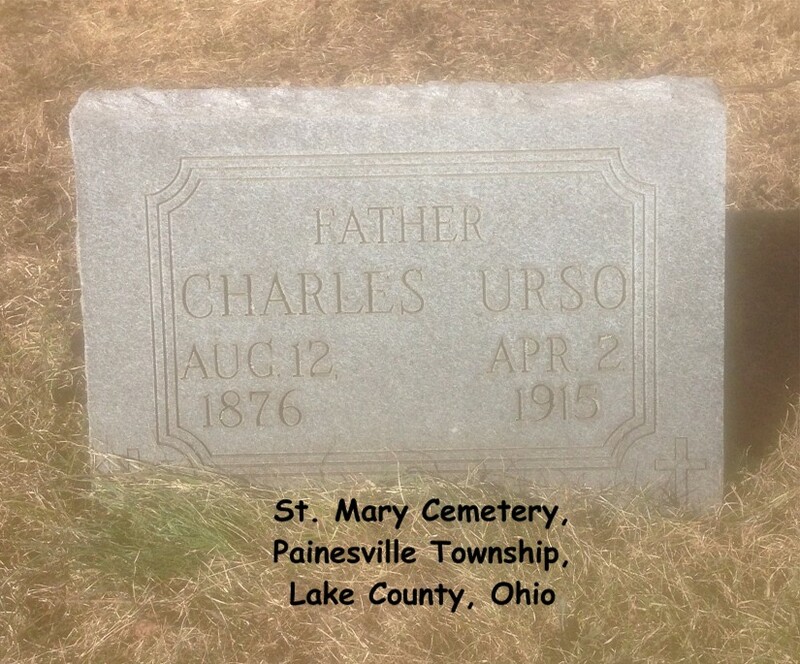 Luciano Urso first appears in the Painesville, Ohio, area about 1903. 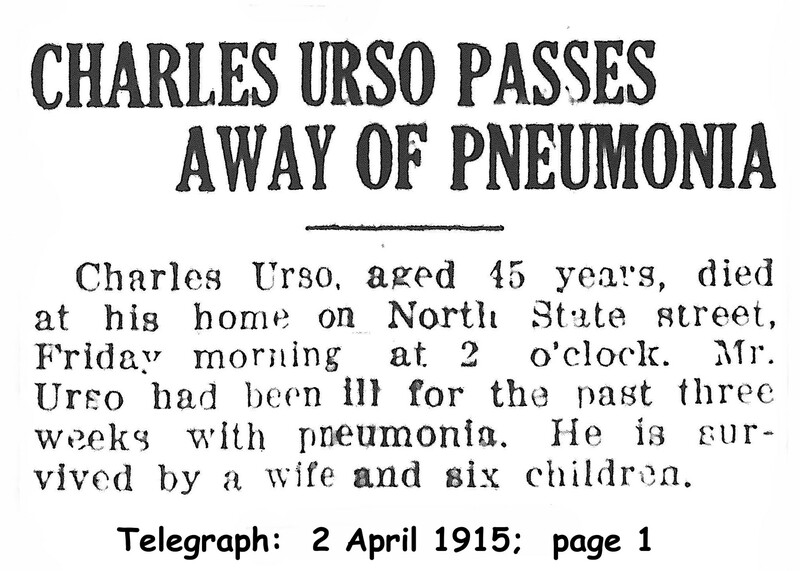 In America, Luciano Urso was known as Charles Urso. Luciano Urso, son of Salvatore Urso and Maria Sampson, was born on August 11, 1877, at Termini Imerese, Sicily. (Another source says Luciano’s date of birth was August 12, 1875.) He married Antonia Pusateri, daughter of Antonio Pusateri and Francesca Schiavo, about 1900, in Sicily. Luciano died on April 2, 1915, at his home, on North State Street, Painesville, Lake County, Ohio, at age 37, of a hemorrhage while being treated for pneumonia. His body was interred at St. Mary Cemetery at Painesville Township, Lake County, Ohio. Luciano Urso immigrated to the United States on October 22, 1902, at age 25, travelling to Coraopolis, Pennsylvania. He immigrated with his wife, mother-in-law, and his wife’s siblings. They were joining his Luciano’s father-in-law, Antonio Pusateri, in Coraopolis. Luciano migrated to Painesville in 1902 or 1903. Luciano’s sister, Rosa Urso, had been living in Painesville since 1895. Another sister, Angela, joined them in Painesville in 1907. Luciano was enumerated for the 1910 Census of the United States, on April 25, 1910, living at Paine Avenue, Painesville, Lake County, Ohio, as a head of household. His name was recorded as Charlie Hoose. Luciano Urso became a citizen of the United States in March, 1912. Luciano resided at 126 Railroad Street, Painesville, Lake County, Ohio, when he was Naturalized. 1. Samuel J. Urso was born on December 26, 1903, at Ohio. Samuel died on March 6, 1986, at age 82. His body was interred at South Ridge Cemetery at Perry, Lake County, Ohio. 2. Anthony Urso was born on August 12, 1905, at Ohio. Anthony died in 1965. His body was interred at Madison Cemetery at Madison, Lake County, Ohio. 3. Josephine Marie Urso was born on July 4, 1907, at Painesville, Lake County, Ohio. She married Philip Fieata. Josephine Marie died on March 6, 2006, at her home, Geneva, Ashtabula County, Ohio, at age 98. Her body was interred at Mount Pleasant Cemetery at Geneva, Ashtabula County, Ohio. 4. 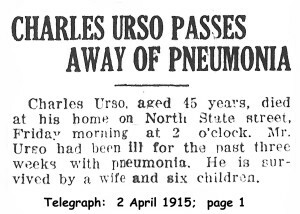 Frank C. Urso was born on March 12, 1910, at Ohio. Frank died on May 26, 1999, at age 89. His body was interred at Riverside Cemetery at Painesville, Lake County, Ohio. 5. Thomas J. Urso was born on July 11, 1911, a Painesville, Lake County, Ohio. He married Elizabeth M. Jacobs. Thomas died on February 15, 2002, at Lake Hospital System, Willoughby, Lake County, Ohio, at age 90. His body was interred at Riverside Cemetery at Painesville, Lake County, Ohio. 6. Augustine John Urso was born on August 12, 1914, at Ohio. Augustine John died on August 3, 1988, at age 73.